¿Que se cuece en medio del Atlantico? It’s about 4500m to the seafloor where we’re working at Hole 395A. That’s about as deep as Mt. Rainier (in Washington State) is high, and almost 3 times as deep as the Grand Canyon! No wonder it takes so long to lower the drill string all the way to the bottom. But yesterday and today, we’ve been working on something that takes much longer—assembling the CORK! The team has been working hard to assemble the casing that will hang more than 500m below the seafloor. Each piece has to be assembled very carefully so that it runs smoothly down the borehole, and so that the equipment inside will survive and function for the next 5 years or more. There are more than 75 pieces that have to be assembled, from the very bottom of the casing (the bull nose) to the CORK wellhead that sits at the top in the re-entry cone on the seafloor. These pieces, which include drill collars, fiberglass casings, steel tubes, and packers (special pieces that inflate to seal off different sections of the hole), all have to be lifted with a crane from wherever they’re stored on the ship to the drill floor, where the drillers use a variety of machinery and good old-fashioned elbow grease to put them all together. They work a lot more slowly with these intricate (and expensive!) pieces than they do with the drill string. When they attach each new piece, they lower the assembly down to the moon pool below, where another crew is waiting to attach a myriad of umbilical tubes that run along the outside of the casing. 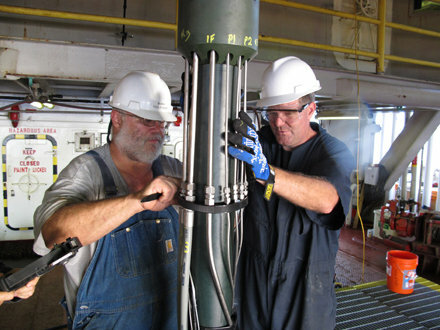 These tubes allow water to be pumped down into the packers to inflate them, and they allow water samples to be taken from valves on the wellhead by ROVs at a later time. The tubes all have to be carefully connected during the assembly so that when they are finally connected to the wellhead, each valve will do what it is intended to do. Imagine making a mistake and having to start all over again! We began this operation yesterday at about 2:00PM. People have been working nonstop all through the night and day, and into another night…it’s a very long process! And all the while, the JR is waiting patiently above the hole, bobbing like a cork.